10 most collectively talented NBA Finals: Where does Cavs-Warriors III rank? Care to guess which series had a combined 13 career MVPs and eight Hall of Famers? It's been quite a while since we've felt a buzz around an NBA Finals like there is around the third installment of this Cleveland Cavaliers vs. Golden State Warriors trilogy. The level, and sheer amount, of talent about to take center stage in this series is, frankly, hard to fathom. Which got us to wondering: Is this the most collectively talented NBA Finals in history? We put this question out to our NBA experts, and after a lot of leg work and some -- discussion -- here's the top 10 we came up with. **Teams that played multiple times with largely the same rosters were only counted once (EX: 2012-2014 Spurs vs. Heat). This one, obviously, looks better in hindsight. At the time, Kevin Durant had yet to become an MVP, and James, though already a three-time MVP and about to become an NBA champion, was not the player he is today, either. Also, James Harden was just a third-year player with no All-Star appearances, while Russell Westbrook was only a two-time All-Star. When it's all said and done, four core players from this series will no-doubt Hall of Famers, and Chris Bosh figures to make it five. And of course, Westbrook or Harden likely will win this season's MVP after authoring two of the greatest statistical seasons in history. This was a loaded series, for sure, but more a sign of things to come. The core of these two teams met twice, and while it wasn't quite the talent level of a few other Lakers-Celtics Finals (which we'll get to), clearly there were some serious stars on the court. Again, it's a relatively recent series, so we can't tally the Hall of Fame players yet, but you can mark down Kobe, Garnett, Pierce and Allen as locks. Gasol is up for debate, but probably gets in. Rondo likely doesn't, but for this stretch with Boston, he was one of the most uniquely gifted players in the league. There were plenty of times that he was the Celtics' best player. In Kobe and Garnett, you've got arguably two of the top 15 players of all-time; most people would say Garnett is at least top 25. Allen, meanwhile, is the all-time 3-point king (until Stephen Curry likely overtakes him), and Pierce will go down as a true Boston legend. Boston won this series, but L.A. came back a few years later and got revenge with largely the same rosters. That's right, Robert Parrish was on the 1996-97 Bulls roster, not that he factored into this ranking one iota; he didn't play a second in the Finals. Forgetting Parrish, you've got the big four in Jordan, Pippen, Stockton and Malone, which represent two of the greatest NBA duos in history, and one of the best rebounders/defenders of all-time in Dennis Rodman. There wasn't the level of depth in this series that you will see in a lot of the others on this list, but it's top-heavy enough to make the rankings. In one series you've got, arguably, a top-five all-time point guard, a top-3 all-time power forward and the single greatest player in history. Speaking of that whole greatest-player-ever debate, Jordan supporters won't like to hear this, but doesn't it say something that the most collectively talented Finals Jordan played in only made eighth on our list? Stockton and Malone were great, obviously, but LeBron James supporters will gladly point out that while Jordan never had to face a team in the Finals with more than two Hall of Famers, or even perennial All-Stars for that matter, James has been slogging it out against truly some of the most talented teams in history -- two of which you'll find very high on this list. Robert Parrish, though nearing the end of his prime in 1985-86, definitely counts here, as the big man averaged better than 16 a game that year for a Celtics team that many consider to be one of the three or four best teams in history. This was the third of Boston's three titles in the 1980s, and you can see why they were so lethal. Bird's greatness goes without saying, as does McHale's (Charles Barkley often calls McHale the best power forward he ever played against), and don't sleep on Dennis Johnson, who averaged 17 points and better than six rebounds and five assists in those Finals. Olajuwon was just getting started in 1986, but he'd been an All-Star in two of his first three seasons in the league. Walton's MVP days were behind him, but he was still a really productive player who won Sixth Man of the Year that season. Just look at the names on that list. Icons in the truest sense. So dominant were Russell and Chamberlain in this era that John Havlicek and Jerry West -- The Logo for crying out loud -- couldn't score even a single regular-season MVP award between them during Hall of Fame careers. And lest you be too young to realize, or too old to remember, just how great Jerry West was, he was named MVP of these Finals despite his Lakers losing in seven games. It remains the only time in history that a player from the losing team was named Finals MVP. Think about this: Elgin Baylor is without question one of the greatest pure scorers in NBA history -- he averaged better than 24 ppg in 11 of his first 12 seasons, including three times averaging over 30 (in 1961-62 the guy scored more than 38 ppg!) -- and he was barely a top-five player in this series. That's some talent, folks. Kind of a sleeper top-five series here, but those 14 collective MVP awards are the most of any series on this list. Two guys in the conversation as top-3 players in history in Magic and Kareem, the original human highlight in Dr. J, and the great Moses Malone. Man, people really sleep on how dominant Moses was. Dude averaged almost 26 points and better than 18 boards for the series. And all these guys were pretty much in their prime; McAdoo was nearing the end of a legendary career, though he still averaged 15 points that season, and while Magic was young, he was already a star, falling a shade over a rebound per game shy of averaging a triple-double in 1982-83. In these Finals, which the Sixers swept, an incredible 11 players -- Kareem, Magic, Wilkes, McAdoo, Malone, Erving, Toney, Cheeks, Cooper (one of the great perimeter defenders of his era), Norm Nixon and Bobby Jones --averaged double-digit scoring for the series. That is wild. Another sleeper top-5 series here (unless you're our esteemed home page managing editor Randy Brickley, who puts the old in old school and immediately called our attention to this one). You might not realize that Jerry Lucas and Dave DeBusschere were among the original 50 greatest players, but they were, though they were nearing the end of their careers in this series. Frankly, the only reason this series isn't higher is because a handful of these guys were near the end of their career, though still high-quality players. Frazier and Monroe were right in their primes, but Wilt was in his final season, and Willis Reed and Jerry West would only play one more year. That said, all those guys could, and did, still play at a high level. This wasn't a situation like Karl Malone on the 2004 Lakers. West averaged better than 21 ppg in the series. Wilt pulled down more than 18 boards a game. Reed went better than 16 and 9 boards and was named Finals MVP. The Knicks took out the Lakers 4-2, representing the last championship the franchise has won. The next two series on this list are about projection, as I think we can all agree that no less than seven player from this Spurs-Heat clash will end up in the Hall of Fame (and again, Bosh will almost certainly make it eight). Arguably the best player ever in LeBron (again, is there a better case for his supremacy than the number of times he's shown up on this list? He gets a lot of flack for creating these super-teams, but the competition he has consistently faced over the years has truly been historic). Arguably the greatest power forward ever in Duncan. At his peak. Wade was probably a top-15 to to-20 player in history. And Tony Parker, people, was NOT a system superstar! He was a star, period. At times the best player on this Spurs team. Kawhi was still young here, but already blossoming (the next year, in fact, he won Finals MVP in the rematch). And of course, there is Ray Allen. One of the greatest shooters ever hitting one of the single biggest shots ever to save the Heat in Game 6, making way for an all-time Game 7 performance from LeBron. Millennial bias? Hardly. Again, no Hall of Famers yet, but you can bank on seven, and maybe, maybe, Iguodala as an eighth, though that's certainly up for strong debate. In the end this series will fall short in terms of sheer number of Hall of Famers, but what absolutely sets it apart is that each of these seven future Hall of Famers are smack dab in the middle of their prime. LeBron is the only one you could argue is on the downside, at least in terms of years in the league, but you could argue he has never played better than he is right now. Listen, the last time someone NOT playing in this series won the MVP award was six years ago when Derrick Rose won in 2010-11, and LeBron should've won that season, too. Think about that. 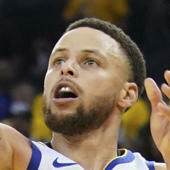 In one series you have the last five MVPs, and that's before you get to Kyrie Irving, who is a stone-cold superstar, and Draymond Green, who will go down as one of the great defensive players ever, and Klay Thompson, who, barring injuries to both or either, will end up second to Curry for every 3-point record in the book. People forget how good Kevin Love is as he's slowly adapted to his role in Cleveland, but he's again starting to remind us of the guy that was a consensus top-five player in the league during his Minnesota days. Think about this: Any one of six guys could drop 50 -- Fifty! -- in a Finals game and it wouldn't at all be shocking. James, Curry, Durant, Thompson, Irving and Love have all done it before. A few of them multiple times. Ultimately, it is very conceivable that three of the top-10 players in history will have played in this series at the peak of their powers. Back to 1987, look at those rosters. Look at those 13 collective MVPs. This was the height of the rivalry that, in many ways, put the NBA on a path to becoming the star-powered league it is today. This is where it started. Bird vs. Magic. And man were these games something else. For the series, the Lakers averaged more than 115 points with a 118.4 offensive rating (for comparison, this year's Warriors, who many consider to be the best offensive team ever, had an offensive rating of 115.6). The Celtics, meanwhile, averaged more than 111 points with a 114.0 offensive rating. Six players averaged more than 20 points. Six. That is outlandish. The Lakers and Celtics each shot 52 percent ... as a team! For the entire series! Magic went for 26 points, 13 assists and 8 boards in winning series MVP. And who could forget maybe the most famous sky hook in NBA history to win Game 4? This was, pretty simply, as good as basketball gets. Also: The Nets remain confident, at least about their offense; Boban!